So I don’t want Mila to be spoiled but I cannot help spoiling her. I try my best but its in my nature. I spoil her in every way I know how. I spoil her with love and kisses and hugs and attention. I try to teach her everything I can and I take her to classes. And of course I spoil her with toys and teddies and anything else I think she might like. Perhaps one day I will be more disciplined but for now especially for her first Christmas I really do want to spoil her rotten. There are literally hundreds of things I would love to buy her and I could have included in this guide but i have tried to narrow it down a little bit to some of my favourites. I have put everything in 2 lookbooks for you – one for toys and one for clothes. But I will talk through some of my favourite pieces! First of all I love everything for babies by Chloe. Perhaps a little extravagant but I am a fashion blogger after all and I just think their styles are so adorable. Especially this faux fur onesie which I am considering getting Mila for St.Moritz. Smallable is one of my latest finds for everything baby related. They have lovely interiors bits for nurseries, bed sheets, toys and clothing. Mila will soon be crawling/walking and I love this practical and adorable pull along rhino – shop it here. Not included on my collage but this beach house bed is literally the dream! You can decorate it with lights – check it out here. And for minimalist nurseries I absolutely love this cloud rocking chair- shop it here! Any of you that follow my insta stories know how much I love going to Gymboree with Mila. Babies love the sound of singing and it helps them learn and this musical hippo is a great companion for a growing baby – shop it here. 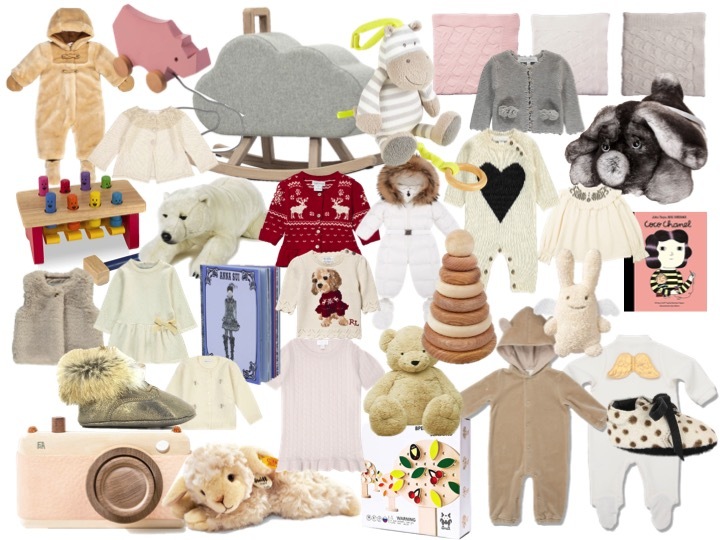 Since before Mila was even born I have been buying for her from both Marie Chantal, Tartine e Chocolat and Bonpoint. I think they are my three favourite stores as the clothing is timeless and chic, and if we have more babies I can easily pass them down to the next one! Plus they have adorable toys too. I love all of the Angel Wings from Marie Chantal for babies, as well as the blankets and the musical whale (which has always worked wonders on getting Mila to sleep and which has so much sentimental value to me because when she was still in my belly and we had just moved into our new home, the nursery was completely empty apart from a chair and the whale! My husband and I used to go in and lie on the floor of her room and play the music and wait for Mila to kick.) From Tartine et Chocolat I love the faux fur gilet, the cream dress with a bow, and the pom pom cardigan – shop it here. I definitely have a thing for giant toys for the nursery. Mila has both a giant giraffe and teddy and I always think how cool it must feel to have everything supersized around you. If you want to go all out then this toy dog from Harrods is so luxurious – it looks so soft and cuddly! Or this giant polar bear -shop it here. Linda The Lamb (another find from Smallable) is also super cute and maybe a bit young for Mila right now but how fun is this toy camera – shop it here. Some other favourite toys include the Melissa & Doug game which you can shop here and this adorable Ivory Angel Bunny Rattle which you can find here.